We strive to be the opposite of what most contractors are today. We are very professional, open, honest and direct. We believe in total disclosure. There are no hidden prices and no surprises. You do not have to be a professional negotiator to get our best price because we don’t negotiate pricing. We simply give the very best price we can our first meeting. All deposits received on projects go directly towards your material. We have worked extremely hard to find the perfect balance of quality materials, combined with professional installation at a reasonable price. The best value and project experience is why people choose Michigan Fence Solutions. 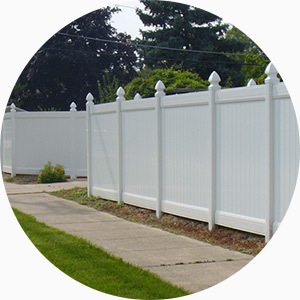 When you call Michigan Fence Solutions for your fence project, be assured that you will be treated with respect, professionalism and honesty. We are here to help you make the best decisions for YOUR fencing needs, and guide YOU in choosing which type of fence and style is right. YOU make all the decisions without any unnecessary pressure. All of the fence materials we offer are manufactured from materials made in the USA, and all of our fabricators and distributors are Michigan-based companies. We make every effort possible to support our home State; from purchasing our materials, to hiring employees, as well as using local companies for our equipment, printing and marketing materials. We have always supported the belief of Keep It In Michigan by supporting only Michigan businesses. You as a customer are kept up-to-date on the progress on your fence. We don’t like surprises and we’re sure you don’t either. Unlike us, very few companies will go though the extensive steps to ensure your new fence is installed not just right, but to last a lifetime. We start by digging a hole that is 36″ to 42″ deep and then belling out the bottom. You are completely covered by our General Contractors Insurance and Workers Compensation Insurance.